Click here to find a set of spark plugs for your vehicle. As any Boy Scout will tell you, making fire requires three main ingredients. These are air, fuel, and heat. This principle remains true when it comes to creating fire in your engine as part of the combustion cycle. The air enters your engine through your air intake after passing through your air filter. The fuel is delivered via your fuel injectors. Finally, the spark plug is responsible for supplying the heat. A spark plug uses electric energy to ignite the air/fuel mixture inside the combustion chamber of the engine. In modern cars, the spark plugs are connected directly to the ignition coils which supply high voltage current to the spark plug. In older cars, one ignition coil is connected to a distributor which directs the current from the ignition coil to all of the spark plugs in sequence. When high voltage current is applied to each spark plug, electricity arcs across the gapped electrode. This electric arc is extremely hot and provides the necessary heat to ignite the air/fuel mixture in each cylinder. Spark plugs come optimized in a number of ways. One of the most prominent features is the number of electrodes that a spark plug has. A typical spark plug has one electrode, however some spark plugs come with two or four electrodes. A higher number of electrodes typically allows the current to be distributed across more points over the many ignition cycles that a spark plug must endure, which makes for a longer lasting spark plug due to reduced electrode wear. For any one ignition cycle, the current will only arc to one of the electrodes, no matter how many are present, so performance is roughly equivalent regardless of electrode count when spark plugs are brand new. In addition to electrode count, certain performance applications may require spark plugs that transfer heat away from the electrode than a different rate than standard. For instance, high compression engines are often outfitted with “colder” spark plugs, which transfer heat to the cylinder head and away from the electrode more efficiently than average sparkplugs. Spark plugs are one of those components that have a decently long shelf life considering how demanding their job is. Fortunately, this means that the service interval for spark plugs on modern cars may be every 50000 miles or more depending on the make and model of your vehicle. Typically, when one spark plug goes bad, the others soon follow, so it’s best to replace them as a set. The following are possible symptoms that you may encounter in the event of spark plugs that are due for replacement. Reduced Fuel Economy – A properly running engine efficiently burns the fuel and air during the combustion cycle. How efficiently the air/fuel mixture is burned has a direct correlation to your vehicle’s fuel efficiency. Worn spark plugs tend to become a weaker ignition source over time, which leads to slowly reduced fuel economy. This change usually happens gradually, and the people who track their fuel mileage are most likely to notice this symptom. Loss of Power – An engine suffering from inefficient combustion due to worn spark plugs will typically feel sluggish. This is usually pretty subtle, however if neglected long enough, worn spark plugs can make a significant difference in engine power. Most people tend to notice that their engine feels a little bit more powerful and a bit more smooth after a spark plug change if they are using their vehicle manufacturer’s recommend service interval. Rough Idle/ Misfire – Spark plugs that are worn and no longer firing optimally can result in engine misfires, which manifest themselves as unsteady idles and rough engine running. If this becomes severe enough, it can occasionally trigger a check engine light in modern cars. Difficulty Starting – If your spark plugs are worn, you may notice that it takes a little longer for your vehicle to turn over during a cold start due to the fact that worn plugs have more difficulty igniting the air/fuel mixture. If your car takes more than a few turns before starting, spark plugs are often to blame. Before you start the work, make sure the engine is cold. If you install spark plugs when the engine is hot, you run the risk of having them loosen on you over time which can damage your cylinder head. We recommend removing and reinstalling one spark plug at a time to avoid criss-crossing your wires and messing up your firing order, which will prevent your engine from running properly (if it will run at all). Step 1 – The first step is to locate your spark plugs. On older vehicles, these are often visible when just looking at the side of the engine. The easiest way to find them is to find the spark plug wires (you have one wire and spark plug for each cylinder in your engine) and follow them until you find their connectors. On modern vehicles, the spark plugs are often buried under the coil packs, which you can also find by following the spark plug wires. If you have coil packs, they will need to be removed before you can access the spark plugs. This can usually be done with a socket and ratchet if necessary. Step 2 – For cars with coil packs, once you have removed the coil pack you can skip to the next step. Otherwise, choose a spark plug and start by removing the spark plug wire. You will need to remove the boot and wire as an assembly from the plug. Never pull on the wire to try and remove the boot from the end of the plug. You’ll most likely damage the wire itself rather than removing the boot. Instead, grip the boot itself. You may need to twist or wiggle the plug boot a small amount to loosen it off the spark plug. Be patient as sometimes it can take a bit of effort to get them off. Step 3 – Once the wire is removed from the first plug, use an appropriately sized spark plug socket and ratchet to remove the spark plug from the cylinder head. You may need to use a socket extension to reach, depending on your engine configuration. As a point of interest, you can look at the spark plug once it has been removed and tell a lot about your engine’s running condition. The electrode of a normally operating spark plug should be a little dirty with a small amount of soot, but not oily or scaly. A manual like Haynes or Chilton usually has a diagram to help assess whether your car is running rich, lean, or normally based on the way your spark plug looks. If not, you can find charts online as well. Spark plug condition as it relates to running condition is independent of vehicle make and model. Step 4 – Once your spark plug is out, it’s time to reinstall the new one. Prior to installation, always make sure that you check the spark plug electrode gap with a gauge (gapping tool) before you install it into the cylinder head. Your owner’s manual or a service manual will tell you the appropriate gap size to adjust to if it’s necessary. Most plugs made specifically for your vehicle will be gapped from the manufacturer, but the diehards out there will check anyway. You may also need to use a little bit of anti-seize depending on your vehicle. When the plug is ready to go back in, use your fingers or put the plug into the socket and use your hand to install the plug until it is finger tight, making absolutely certain that you do not cross thread the plug. When it’s finger tight in the cylinder head, use the ratchet to tighten the spark plug snugly per the spark plug manufacturer’s directions. You can use a torque wrench to tighten accurately to the manufacturer specifications. Step 5 – Before you put the spark plug wire and boot (or coil pack) back on the plug, give them a quick check to make sure they are in good shape. The boot should be free from cracking, brittleness, or cuts. The wire should be in a similar condition without breaks or cuts. If they need to be replaced, now is a great time to do so. If they are in good shape, you can add a very small amount of dielectric grease inside the spark plug wire boot (or coil pack boot) to prevent the boot from sticking to the spark plug body which will help the boot come off the plug more easily in the future (and it won’t affect the spark transmission from wire to plug if you apply carefully and conservatively). Once you are satisfied, reinstall the coil pack or wire back on the plug. Step 6 – With one plug out of the way, you just need to follow the same process for the rest of the plugs. Just remember to only do one plug at a time. When all plugs have been replaced, you can start the engine to verify all your hard work was done correctly. There are tons of spark plug options out there, and we know first hand that it can be a tough choice when you are in the market for a new set. In order to save you some legwork, we have listed our favorite brands that we have used over the years in hopes of saving you some time. 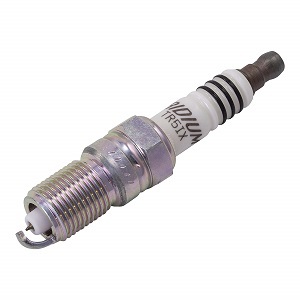 NGK is a mainstay in the spark plug world, and they are well known for specializing in spark plugs and oxygen sensors. They have ample options for stock and performance spark plugs for the vast majority of vehicles on the road today. They will make your old Datsun just as happy as they will make your new BMW. We have had nothing but great experiences with NGK and can confidently recommend their spark plugs due to many years of reliable performance in our vehicles. Click here to find a set of NGK spark plugs for your vehicle. Bosch is a huge auto parts supplier worldwide, and if you have a car, it’s reasonable to assume that there are at least a few Bosch parts under the hood. Unsurprisingly, considering their wide reach and range of great components, Bosch makes a really nice set of spark plugs. We see them pretty often in German cars, but they make great spark plugs that will do the job well regardless of the country of origin for your vehicle. Overall they are a smart and safe choice for pretty much any vehicle. Click here to find a set of Bosch spark plugs for your vehicle. Denso International is a global auto supplier in 36 countries and regions around the globe. They have a US headquarters in Michigan and manufacturing facilities in multiple locations across the US, so just as you’d expect, they are especially well liked by drivers of American cars. They make a good quality spark plug that can withstand the test of time. Another bonus is that they are easy to find and relatively easy on the wallet. Overall, it’s hard to go wrong if you opt to get a set of Densos. Click here to find a set of Denso spark plugs for your vehicle. Autolite has produced and sold well over 10 billion spark plugs over the lifespan of the company, which should be your first clue that they know what they are doing. Autolite has had quite a long history in the business of making spark plugs, so it makes perfect sense that they produce quality parts. Their parts last a long time, are easy to find, and are pretty affordable so it’s hard to argue against putting a set in your vehicle. Overall, we think you’ll be very satisfied if you choose to grab a set of Autolites. Click here to find a set of Autolite spark plugs for your vehicle.